We agreed, anticipating this would be good promotion of their work. The school agreed to Simon Collins, the NZ Herald’s Education Reporter, coming, with a photographer, to watch a full run through of the students’ speeches, and then to interview them. The story, appeared online that same evening, with the headline, Tongan student pleads: 'Don't make me a brown Palangi'. The battle lines were drawn, with each comment drawing the opposing side into a response that in Trollworld, is never going to go anywhere. The behaviour of those who make racist comments on social media stories is well known to all of us who make an intentional decision to speak up against injustice of all types. Unfortunately, it’s part of the territory. However, I would have hoped that, in spite of the egos of these commenters who are hell-bent on publicly demonstrating their racism, they would find it in themselves to consider the impact of their vitriol on 15-17 year-old youth. It seems not. Comments such as “go back to Tonga” and “count yourself lucky” to being educated in New Zealand (to use some of the milder comments) show a total ignorance of New Zealand’s history, or the fact that we are living on islands in the Pacific ourselves, or the fact that fewer than 51% of children in NZ schools last year were Pakeha - and that number is declining. Our education landscape has changed, whether these commenters realise it or not. Their teacher, one troll said, was obviously a “snowflake.” Getting my colour right was about the only accurate word I read in the whole diatribe. Fortunately, the students couldn’t have cared less about the trolls, realising that the comments perfectly confirmed the outcome of their research, that we definitely do live in a divided, and deeply racist society. The article has been ‘reacted to’ on Facebook 2.3k times, commented on by 861 people and shared 427 times so far. A rough estimate would say there as many negative comments as there are positive. That should concern us. I’ve stopped reading them, but I have a comment of my own for the NZ Herald and Simon Collins. I realise that conflict and sensational headlines sell newspapers, but really Simon, or your headline writer, were “brown palangi” and challenging “the notion that Māori and Pasifika students are 'dumb',” the key messages you heard in our students’ work? The article itself was largely positive, which we appreciate, but I have a major issue with the headline. In the further discussion with the students, regarding your current investigation into the review of NCEA, you brought your preconceived notions about the value of external assessment, and did not have accurate background information, or research about NCEA requirements to frame your questions. This, I fear, does not bode well for the credibility of that series. More than stunning if there is such a thing. Thought-provoking, challenging, self-assured, articulate, fearless, proud, showing such great evidence of deep learning and I also got a sense of such deep respect for each other. Gives a sense of real hope for the future. We thank you! 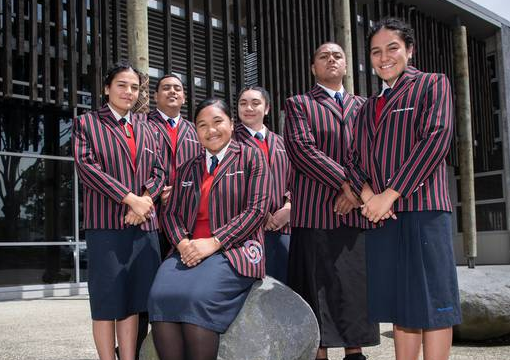 The positive path taken by the many NZ Herald commenters, who applauded the students’ work and effectively spoke back to the racism, was amplified and extended by the wonderfully positive response from those who heard their Keynote at the conference. Invitations to speak, to be interviewed, and to publish their work are rolling in. Someone emailed our students directly to offer their congratulations. Today, they were visited by the Chief Executive for the Ministry for Pacific Peoples, who wants to know more about their work. The Keynote presentation obviously doesn’t just ‘happen’ —it is the result of months of work, supported by the wider staff. The Warrior-Researchers’ work both arises from the philosophy and practice of Kia Aroha College – and contributes to further evolving that pedagogy within the school. It comes out of a decision to place culture and cultural identity intentionally at the centre of curriculum design, and not as an incidental outcome of it. It comes out of a flexible team-teaching organisation where teachers work across several classes of students, where learning is inquiry-based, with a wide range of choices and options, where timetabling is flexible and there is time to work intensively on the current study, and where there is minimal whole-class, teacher-directed instruction. It comes out of a curriculum that is integrated, not just across subject disciplines, but with students’ lives, and realities. This integrated curriculum approach, already built around issues of social concern which are specifically relevant to students’ families, communities and cultures, merged into a curriculum approach called Youth Participatory Action Research (YPAR) and learning through a critical, social justice framework. The researchers participated in online training with Professor Antwi Akom and his team, from San Francisco State University and ISEEED, using Streetwyze, a mobile, mapping platform that ground-truths local knowledge and real-time data about how people are experiencing cities and services, and turns them into action. This year, the school made a decision to include Warrior-Teachers in the Warrior-Research group. Teachers were invited to apply to participate, outlining how they felt it would impact on their practice. Seven teachers applied, and all joined the group, both as participants and observers, with the goal that each would develop their own Warrior-Researcher group back in their teams and classes. They were able to observe the students’ work through the YPAR process, both in person, and in an online “whānau” using Microsoft Teams. We looked at what a keynote presentation involves (this was their third major keynote this year). We studied reports and other research, we asked whānau about their experiences of racism, we learned about informed consent, methodology, methods, ethics, and the students presented their research proposal as an ‘elevator pitch,’ that required them to be very focused and specific. We want to look closely at our community of Otara, and compare it with our more wealthy neighbouring communities. The overall topic is racism, as we and our families, community experience it. At every stage, the key questions were, what does this mean for us, as Māori learners, Samoan, learners, Tongan learners? In each aspect participants’ experiences included the counter-stories, the identification of—as Streetwyze calls it—“good stuff” vs “bad stuff” and “stuff” that could be fixed. It’s no surprise to find our young people had an intimate, deep, street-level knowledge of all of these, confirming Streetwyze’s claim that this technology helps make the invisible, visible, and that the people closest to the problem are also the people closest to the solution. In each of their chosen sub-topics, students asked where is the existing data—the official statistics—and where is the community knowledge and experience, the deeper data to ground-truth our research? The group watched documentaries, followed media stories, interviewed families and community workers, a Health Organisation CEO and school staff. They used online surveys of fellow-students, students in other schools, family members and educators, and analysed the data. They visited community supermarkets and took photos and filmed the differences between Otara and neighbouring communities. Everything was plotted on the Streetwyze map which soon showed us patterns of inequality and reality—as well as our community’s strength and solutions. As a great example of our community’s ground-truth was the rapid growth a Pātaka Kai - started with one of these free street pantries in Otara, by former students of our school in August, to well over 100 across the country just three months later. Plotting these on Streetwyze showed the urgent need in communities like ours. They wrote many drafts, they produced a documentary, they timed their presentation to the exact minute, and they practised—for hours! They adapted to last minute changes – stepping in at the last minute when others couldn’t make it, and they did a wonderful job. Every student began their speech in their own language, locating themselves within their family’s heritage and history. Their knowledge of their cultural identity grounded their research and was woven through their presentation. This is a critical, culturally sustaining, pedagogy of whānau in action. The work of the Warrior Researchers is a direct result of the work of Kia Aroha College to deliberately decolonise the curriculum, and our definitions of success and achievement which, for the school, are spelled out in the Graduate Profiles for Year 13 learners, specifically aim for revolutionising learning, for conscientisation, taking action and speaking out, for social justice, and transformation. These are Warrior-Scholars, and they are a formidable force for change. A blog about the Pātaka Kai movement is coming soon. Newer PostNow I'M the Headline!